Sorry for the lack of posts this week, but I’m back! And let me explain my absence. Who here has a cat? Has your cat ever gone missing? Maybe right before you’re supposed to catch a plane somewhere? 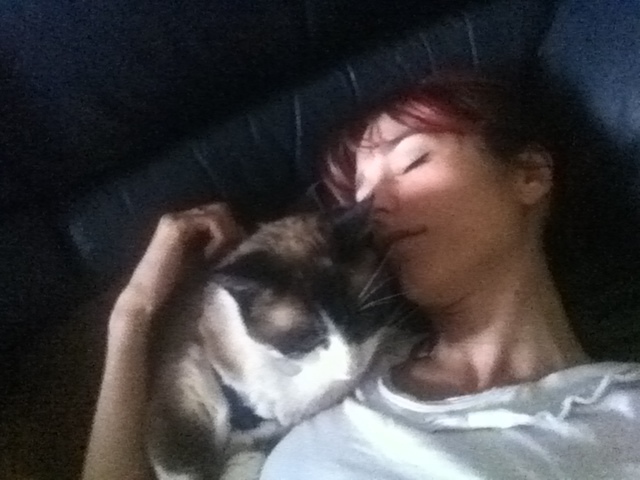 Last Friday I brought my cat over to a new friend in Santa Monica for safe-keeping while I’ll be in France. My flight was to be on Tuesday, and I was going to stop by a couple of times to make sure he was OK before I left. One day later, he made his escape. I don’t want to share the details, because I’m not trying to blame anyone. But point is, he got out, sprinted across the street, and vanished. I came over a few hours later with “his” sweatshirt, and walked around the neighbourhood ringing his bell. I came over again later that night to do the same. No kitty. After 48 hours of no kitty, I decided to postpone my trip back to Paris, and look for some professional help. I didn’t want to waste any time. So I recruited Landa from www.lostpetdetection.com and received her lengthy PDF on searching for missing cats. We started right away with two humane traps (purchased new off of craigslist – saved about $90!) and bright neon posters strategically placed around the neighbourhood. We’d already hung many 8X10 posters the day before. And yes, you heard that, I postponed my flight. I gave myself 8 more days. Which means the plan I had in place for my return was kind of spoiled. And even as of this moment, I don’t know where I’m going to stay once I reach France. We spent several hours walking around the neighbourhood, day and night, ringing his little bell, calling his name, shining a high powered (and not long-lasting) flashlight around looking for cat eyes in the dark. One neighbour hooked us up with a neighbourhood email newsletter sort of thing, so that we could alert more people that way. The next day (Wednesday, I believe) we received two possible sightings. The troubling thing was, though, that they were several blocks down the street. We followed up on them anyway. One woman saw her cat hanging with a new furry friend. And then a few houses down from her, a man said he’d petted “that cat.” Hm. We papered that block too. On Friday I was starting to get anxious and talked to Landa about her search dogs. It was not a cheap tool to use in a search for a missing pet, but it seemed like a faster way to determine his path than waiting on possible tips. I reserved the dogs for Sunday. 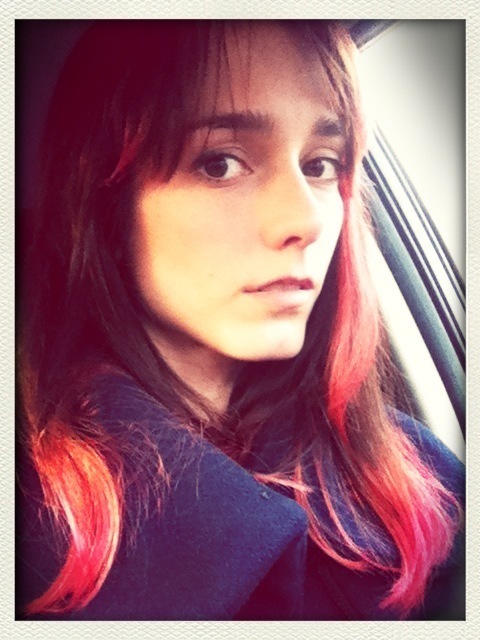 Friday was also the day my hair turned pink. Oh, not all of it. But you know how stress supposedly can give you grey hairs? I take it a step further. It probably wouldn’t have happened if my friend wasn’t prepared with all the bleaching and dying supplies, and it wasn’t premeditated. But in times of stress, I take it out on my hair. I’d been dealing with more than just a missing cat, this week. Highlights also include income taxes (due) and meeting the ex’s new girlfriend. Yay! Around noon on Saturday we got a call from a woman who snapped a photo of a cat that may have been Elliot not far from the escape point, in her yard just a block over. I rushed over, we rang the bell… no answer. We waited impatiently, running some other errands, until we heard back and went to confirm the sighting. Which we did. 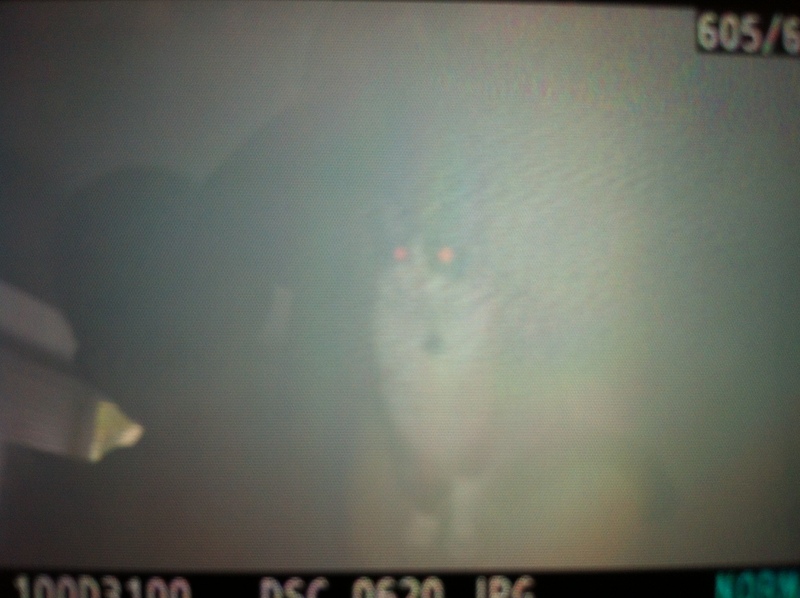 There in the middle of the dark, blurry photo was my kitty face. We made a plan to lure him with food that night. But about a half an hour later, we got a call. He was back, come over! We rushed over and into her backyard, where Elliot was about to leap over a tall fence. I called him, and he turned. It wasn’t a beautiful reunion with the cat running towards me though. He seemed hesitant, and walked along the fence. So I crawled closer until I could pet him and grab him. Kitty nabbed. Bloodhounds canceled.